As the food research and product development project manager at Lehi Valley Trading Company, I’m often asked how we develop new products. The process, from the new product idea all the way to an order being placed, is what I enjoy most about my job. The chain of events often begins with a customer request or a new concept idea from the sales and marketing team. An example of this process is our company’s history with one of our best-selling products, corn puffs. How can that little puff come from an ear of corn? You might think it requires a lot of fancy ingredients, but it’s just science. It involves temperature, pressure, moisture levels, and, of course, corn. The proper balance of these different factors controls the environment in the equipment that produces the puff. When I started at Lehi Valley, the only flavor we produced was our butter toffee puff. The company had an initiative to expand the flavor line which resulted in monthly meetings with the marketing, sales, production and operations teams to discuss new product flavors and evaluate prototype samples. Based on consumer requests, we focused on flavors that would be widely accepted and sell well. 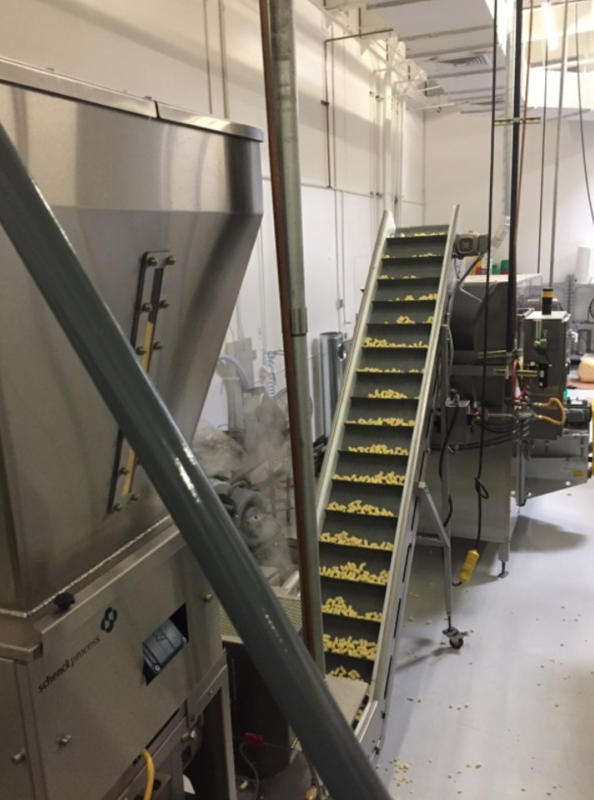 Along with expanding our flavor options, we wanted to bring in extruding equipment so we could manufacture the plain puffs in house. Now that we have the necessary equipment, we’ve expanded the puff flavors to include caramel, cinnamon roll, sea salted caramel, and coconut. Cornmeal is the only ingredient. First, we mix in a little bit of water to the desired moisture level. The consistency of the cornmeal/water mixture is like a thick paste. 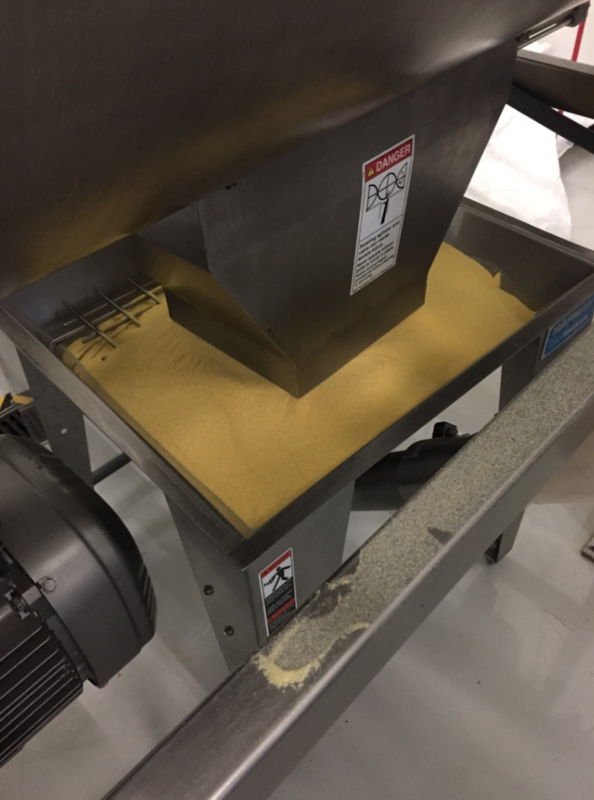 Next, the wet cornmeal loads into an extruding machine that forms the shape of the collette (corn puff). An auger pushes the mixture through a die as it is exposed to high pressure. This develops the proper temperature to change the moisture in the cornmeal paste into steam, creating air cells in the collette, and puffs the corn. After the puffed mixture pushes through the die, a rotating knife blade cuts off the collette to whatever size and shape you select. At this point, the collettes are conveyed through an oven for further drying. The result is the plain corn collette, which is about four percent moisture and feels crispy. Next, we add the flavor. Lehi Valley currently produces sweet puffs with flavors like butter toffee, caramel, cinnamon roll, sea salted caramel, and coconut. 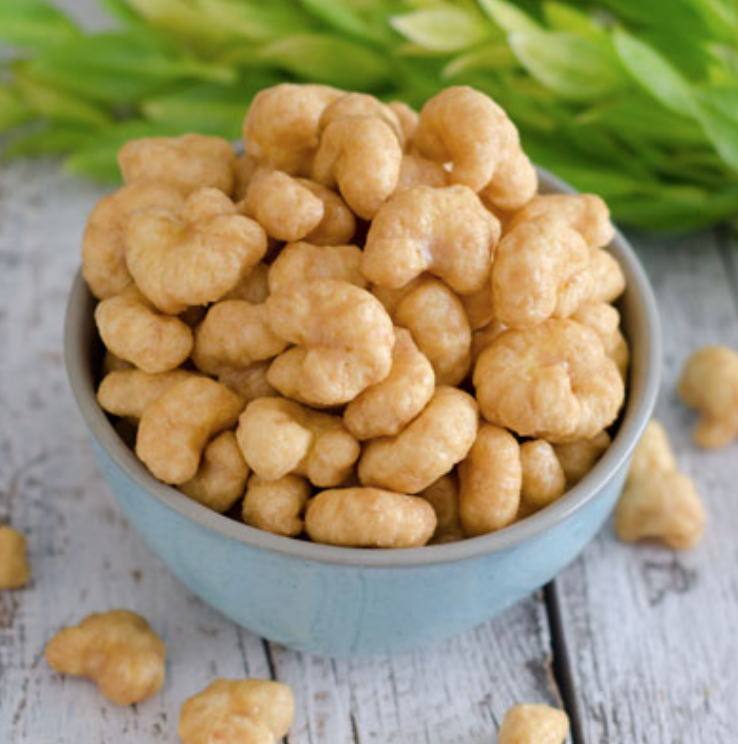 We produce our sweet puffs, starting with a similar process as a candy manufacturer would use, by making a caramel or candy type solution in a kettle. The goal is to make a hard shell on the collette so the finished flavored puffs are a crunchy snack, and not soft and chewy. The finished product texture is determined by how you cook it. The cooked “caramel/candy” liquid then is applied to the plain corn collettes. The coated collettes are then removed from the kettle and separated. Once they cool to room temperature, the coating becomes a crunchy shell and they are ready for packaging. We package the flavored puffs for consumers on a form and fill machine. The packaging material (film) starts flat on a roll like aluminum foil or plastic wrap. The machine takes the film and forms and seals it, essentially becoming a tube. The flavored puffs are mechanically measured, for a specified amount, in hoppers that drop into the tube of packaging film. The form and fill machine heat seals the top and bottom, and cuts each bag off the tube. We then hand pack individual retail bags into cases, put them on pallets and ship them off to our customers before hitting your pantry shelf.